Our local experts surveyed guests, canvassed review sites, and researched hundreds of different Washington DC tours to select our annual best of the best list. Discover why Monuments by Moonlight is rated one of DC’s Top 20 Best Kept Secrets. All the cherished monuments you’ve read about in books, seen in movies, and learned about in school, exude a life of their own on this moonlit tour. Witness Abraham Lincoln bathed in light as he surveys the National Mall. Stand before The Marine Corps War Memorial, a bronze sculpture depicting the day five Marines and one Navy corpsman raised the American flag after a crucial victory in the Battle of Iwo Jima. The glowing dome and grand columns of the Capitol Building and so much more await you on this enchanted excursion through past and present. This top-ranked, TripAdvisor Certificate of Excellence winning, hop on/off sightseeing tour delivers the very best of Washington DC. With 25 stops that cover all the major monuments and points of interest, this is a great way to get the lay of the land. You’ll learn all about the history and political legacy of DC while cruising in a state-of-the-art, open-air stadium trolley that offers great sightlines no matter where you sit. The knowledgeable guides let you in on all sorts of “inside-the-Beltway” insight in a highly entertaining way. On this tour expect to see the White House, the Holocaust Memorial Museum, the Lincoln Memorial, the National Archives, the Smithsonian, the Jefferson Memorial and so much more! Also, the fact that this is the only tour operator authorized to enter Arlington National Cemetery, it’s like having two DC tours in one! The attractive hop-on-hop-off option on these tours allows you to disembark and re-board at any time during their hours of operation so you can enjoy the city at your own pace. Start your Duck tour at magnificent Union Station where you’ll climb aboard a two and a half ton amphibious vehicle originally designed to transport troops, munitions, and supplies to European beaches during WWII. Today, this road-ready, seaworthy vessel will transport you to all of the most important landmarks in DC! You’ll learn all about these monuments and points of interest from a highly skilled staff of Duck captains who will give you the inside scoop on the Nation’s Capital. Once across the Arlington Memorial Bridge, your DUCK prepares for SPLASHDOWN! You’ll launch into the great Potomac River for a rare perspective of Washington DC. At this point of the tour, kids are always welcome to take the duck for a spin under the captain’s supervision! As the preeminent family of museums entrusted to document the American experience on planet Earth, the Smithsonian has an enormous treasure trove of exhibits to explore. 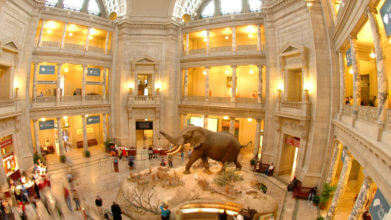 They offer 16 themed museum tours, each one delving deep into a particular subject matter. Choose between Women’s History, Asian-Pacific America, World War I, Garden Lover, Spring Fling, Aerospace, Nature Lover, With Dad (a tour that examines people, places and things that dads and their kids share), Art Lover, With Mom, With Kids, With Friends (see: With Dad), History Buff, Presidents Tour, Civil War Tour, and African-American Stories. The incredible breadth of detail, information and exhibits are all explored across all 16 museums located in the district. For an unequaled museum experience at some of the finest institutions of its kind in the world, make sure the Smithsonian gets on your to-see list! The DC Sites by Segway tour provides great introductions to Washington, DC and Alexandria, VA. It is a fun and interactive way to sightsee and get familiar with these cities. This tour goes to popular sites as well as some that you may not be as familiar with. Your tour guide will provide you with fun facts about the local history and provide insider tips that will be helpful to you as you plan the rest of your visit to Washington, DC. The Segway tours have a maximum of eight people at a time and are completed at a relaxing pace. You do not need to be an avid ‘glider’ to Segway the sites! All Segway tours include a 30 minute training period to make sure you are comfortable and safe. One of the great many advantages of living in a democracy is that you get to see first hand where the heads of state lay their heads down every night. In the case of the United States, that place is the one-and-only White House. As one would expect, there is a fair amount of planning required before you can take your self-guided tour through the eight rooms available for public inspection. Due to beefed-up security, one must write to his or her congressperson with your request to participate in the tour. It is recommended that you submit your request between three weeks to six months of your visit. Though there is more work to do here than in any other tour of the city, it is well worth it. Plus, if you’ve got a question or presidential trivia that needs answering, approach any of the Secret Service agents in the vicinity and they’ll be glad to offer up an answer! Develop your tastes for the city on the Potomac with this cultural and culinary walking tour through the U Street & Shaw neighborhoods. Enjoy delicious tastings from four locally owned restaurants and eateries while taking in the ambiance of these iconic neighborhoods. You’ll learn about the interesting culture and history of the area that makes each of them so distinct, from classic chili dogs that have stood the test of time, to trendy DC favorites and grub for the on-the-go gourmet. There will be local beers on tap you’ll be encouraged to sample on an adventure that will satisfy your stomach and leave you excited to explore even more! Located in nearby Arlington, Virginia, the Arlington National Cemetery is the final resting place for over 400,000 service members and their families, elected officials, Supreme Court justices and prisoners of war. It is an enduring tribute to those who’ve dedicated their lives to defending the ideals of our nation. A visit here will leave an indelible impression on your spirit. There are more than 600 acres of hallowed ground and they’re best explored aboard Arlington National Cemetery Tours. Aboard the tour, you’ll learn about the cemetery’s history, the heroes who rest there, and other stories from a knowledgeable guide. The continuous 45-60 minute loop transports you to notable graves and memorials with the opportunity to hop on and off at several important locations inside the property and explore further.